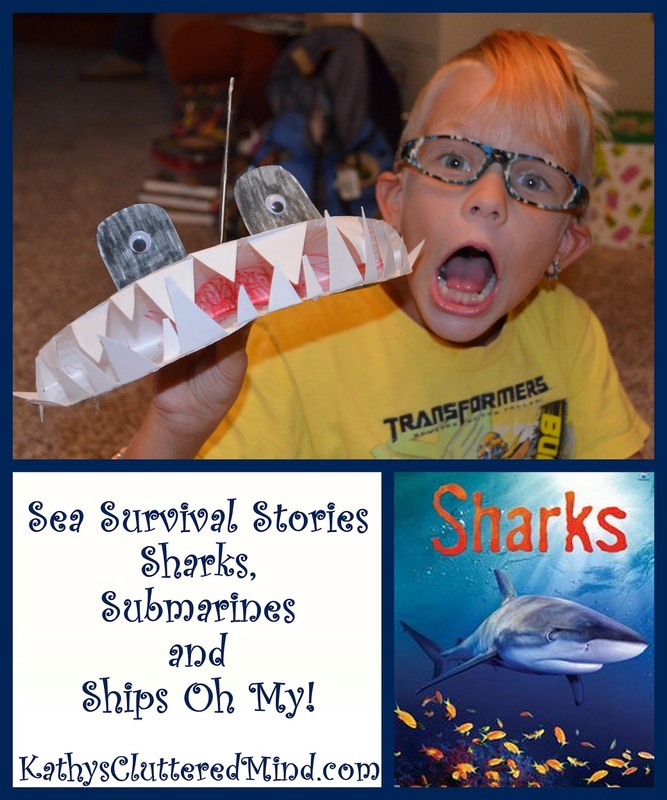 Kathys Cluttered Mind: Sea Survival Stories - Sharks, Submarines and Ships Oh My! Sea Survival Stories - Sharks, Submarines and Ships Oh My! We love reading and hands on learning so of course I couldn't resist participating in another online book club. The last Thursday of every month I will be joining some of my Usborne friends in the Story Corner Blog Hop. Each month there will be a theme and I will share one of our favorite Usborne books and a hands on learning activity to go along with it. Make sure you also follow my Usborne Facebook page where I share about literacy tips, book deals, giveaways, new arrivals, upcoming party information and more. - Kathys Cluttered Book Nook. This month's theme was beaches/oceans so the book I chose to share with you is called True Survival Stories. This book is part of the True Stories Collection which are great chapter books for children ages 9 years and older. True Survival Stories features 10 stories, 4 of which involve the ocean. From shark attacks and blazing airships to exploding spacecraft and sinking submarines, these are real stories of people who have stared death in the face and lived to tell the tale. The book is a 100 page paperback and costs just $4.99. Be sure to also check out these other shark and ship resources from Usborne. We decided to do a shark craft to go along with this book. Fold the 1st paper plate in half, this is the body/jaws. Fold the 2nd paper plate in half then cut it in half to make the fin. Glue the pieces together in the middle. Cut triangles out of the 3rd paper plate, these are the teeth. Also cut a large oval out of the 3rd paper place, then cut it in half to make the eyes. Color or paint all the pieces gray. Glue the fin piece to the top of the 1st paper plate along with the eyes on each side of the fin. Glue wiggle eyes on the semi ovals. Glue the teeth around the opening on the 1st paper plate. 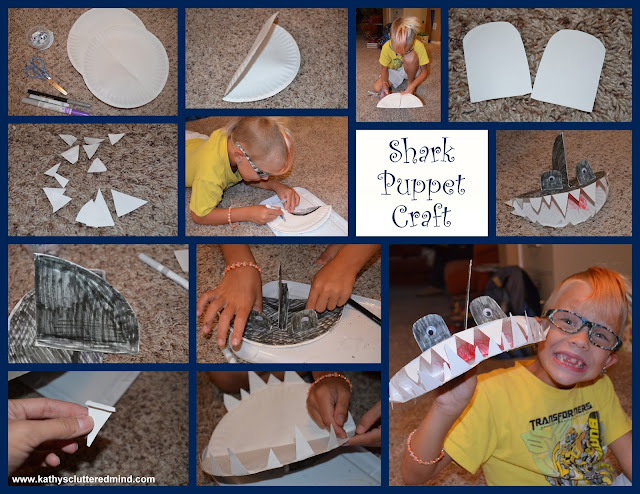 Have fun with your shark puppet. 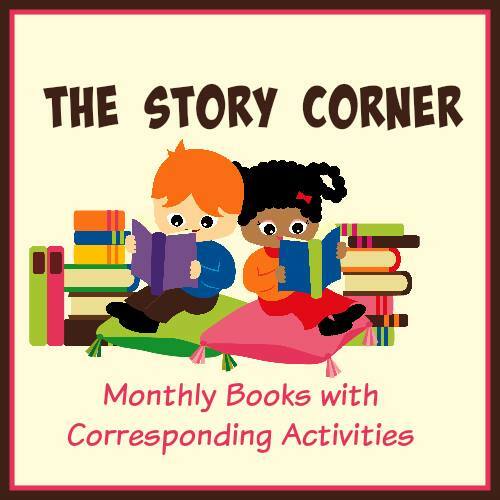 Each month we feature different themed books and corresponding activities! This month’s theme is summer so make sure you check out all the other posts from my blogger friends!